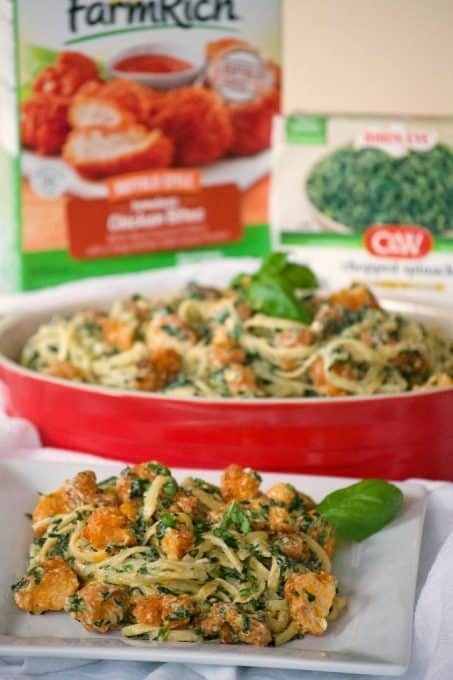 Buffalo Chicken Spinach Alfredo – with frozen Farm Rich Buffalo Chicken, frozen Birds Eye Chopped Spinach, your favorite pasta and a homemade Alfredo sauce you can make an easy dinner that the family will love. A new year, new beginning and a whole bunch of new recipes! I’m excited for what’s in store in the year ahead and SO look forward to bringing you plenty of delicious and easy recipes that the whole family will enjoy. 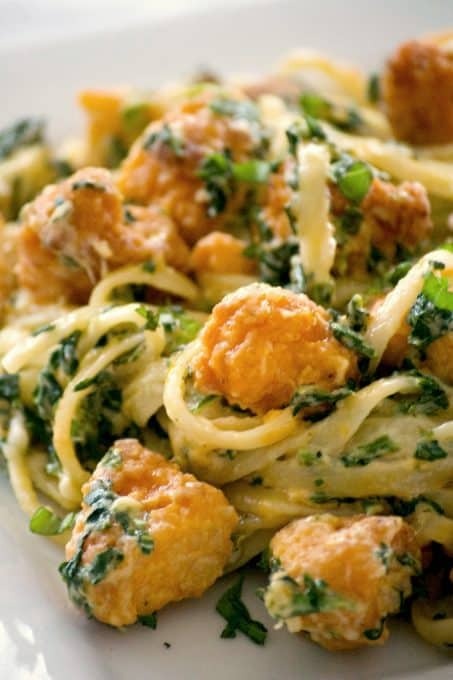 It all starts with this Buffalo Chicken Spinach Alfredo. 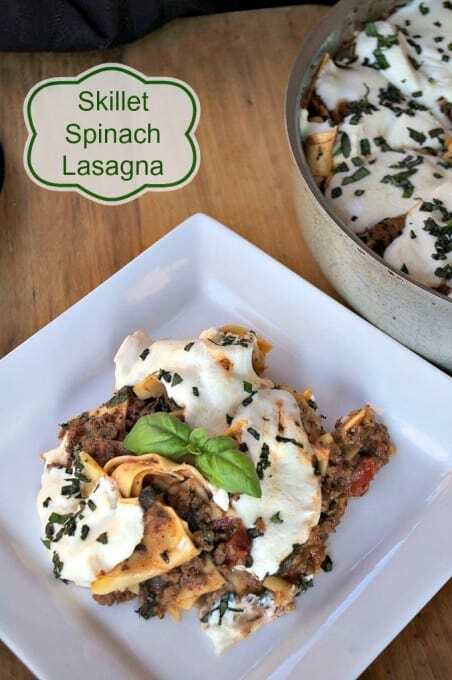 It will make a perfect weeknight meal with the kids headed back to school. With Fry’s and their Freezer Fresh Ideas, you can create healthy meals for your family to enjoy in no time. You’ll be happy that you’re not spending money on fast food, giving your family meals you feel good about and they love the way they taste! Be sure to visit Freezer Fresh Ideas to find coupons, great recipes, and articles! I always make sure I have a great selection of frozen foods on hand so I can make a variety of meals that will be easy, fun and delicious. 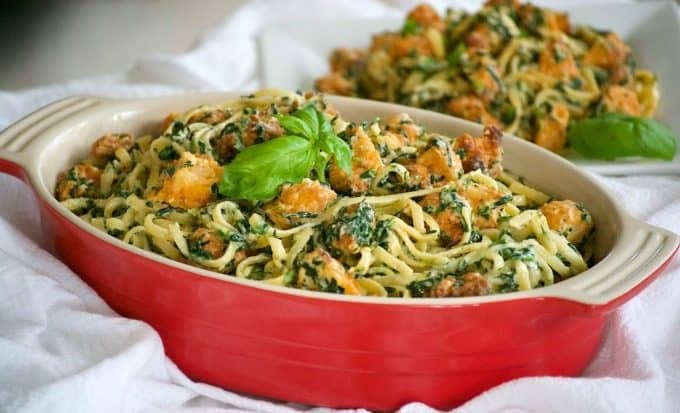 We eat a lot of chicken and pasta, so I knew when I combined FarmRich Buffalo Style Chicken Bites, Birds Eye Chopped Spinach with our favorite Alfredo sauce and some pasta that it was sure to be a hit. Needless to say, the family really enjoyed it and our son couldn’t get enough! 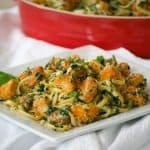 The cheesy creaminess of the pasta is perfect with the taste of the Buffalo chicken. 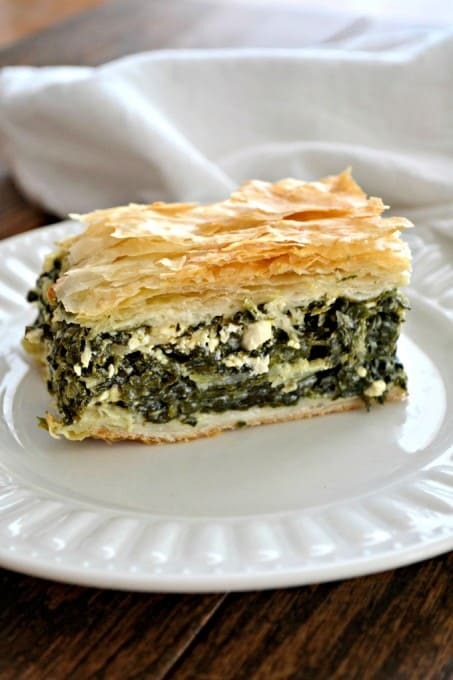 I also love the convenience of the chopped spinach and that I can make the dinner even better with it. This will definitely be a regular dish on our menu rotation. In a microwavable-safe bowl, place the Birds Eye Chopped Spinach. Cover and microwave for 2 1/2 minutes. Remove and stir with a fork. Cover, return to microwave and cook for an additional 2 1/2 minutes. Place into a colander and press with a spoon to remove excess moisture. Arrange the FarmRich Chicken Bites on a baking sheet in a single layer and bake for 8 minutes. Remove from oven, turn pieces over, and bake for an additional 8 minutes. Place the unopened Buffalo sauce packet into a small bowl of hot water for 6 - 8 minutes. Remove from water when thawed and pour into a large bowl. 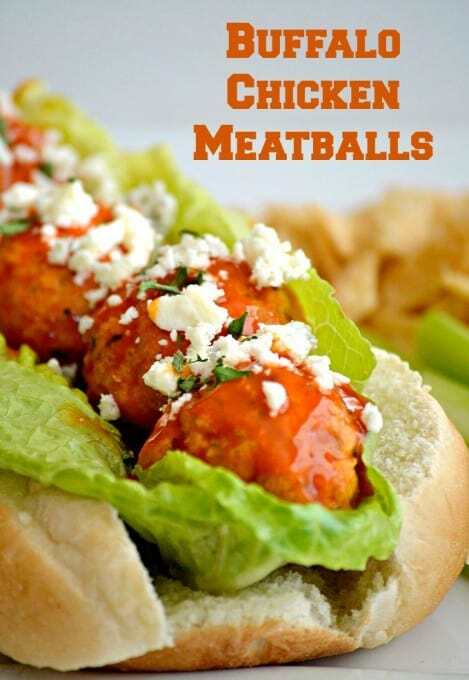 Cut larger chicken pieces so that they are bite size and place into bowl with Buffalo sauce. Toss to completely coat. Boil pasta to al dente according to manufacturer's directions. Into a large measuring cup, pour 1/4 cup of the heavy cream. Add the two teaspoons flour, whisking constantly until smooth. Add the remaining 1 1/2 cups heavy cream and mix. Add the minced garlic and saute until fragrant, about 2 - 3 minutes. Slowly pour the heavy cream mixture into the skillet and whisk until hot, but not boiling. Add the Parmesan cheese and whisk until completely melted and not grainy. Add salt to taste, and pepper. Place the spinach into the skillet and mix thoroughly. Add the pasta and gently toss to completely coat. Add the Buffalo Chicken and mix.